Day 1 & Day 2 Metagame Breakdown! What's better than coffee, bacon, and eggs in the morning? For a coverage writer, it would be waking up on Sunday morning to find out that the metagame breakdown was all done up for us! Not just for Day 1, but for Day 2 as well! Thanks to Willy Edel's dedicated team, particularly a diligent William Marques, we are able to present the full overview of São Paulo's metagame. After poring through the 1,429 pages in Day 1 and also 232 in Day 2, here are the numbers for your viewing pleasure. At first glance, Mardu Pyromancer and Tron represent the top-two most played archetypes in Day 1. However, White-Blue Control decks and Jeskai Control decks, if you considered them the same strategy, added up to more than ten percent of the entire field, which meant that there was a chance to play against Teferi, Hero of Dominaria once every ten encounters. The next three most popular archetypes were aggro decks, namely Humans, Burn, and Affinity (with Hardened Scales and without). 25 decks occupied at least one percent of the field, while 50 other unique archetypes made up the rest of the metagame. What were some examples? Lantern Control, Blue Moon, 8 Rack, Amulet Titan, Taking Turns, Restore Balance, Faeries, Wizards, Soul Sisters, Polymorph Combo, and more! If you consider each and every single of these distinct decks, that's at least 75 different ways to play Modern! Don't you love this game? Moving on to Day 2, the top performing decks were Tron, Humans, and Burn, followed by a three-way tie between Mardu Pyromancer, Affinity, and Krark-Clan Ironworks. How can we interpret this data when we place the numbers side by side? Mardu Pyromancer took 8.9% in Day 1, but only 6.1% in Day 2, meaning that the conversion rate wasn't quite what these players had hoped. Similarly, Jeskai and White-Blue Control had lackluster win rates. On the other end of the spectrum, the Krark-Clan Ironworks did amazing, going up from 2.7% to 6.1% of the metagame! Once again, thanks to the tournament organizers and their dedicated staff for making this extensive metagame breakdown happen. 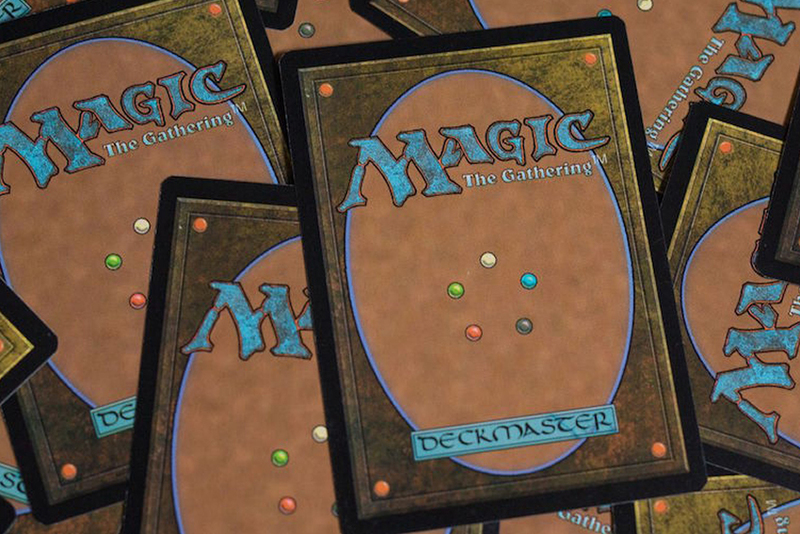 We hope this will help you decide what deck to bring to your next Modern tournament! With 75 different decks represented at São Paulo, it was Hardened Scales Affinity which was the freshest archetype from among the lot. Despite breaking into the Modern scene only recently, it was not clear who the original designer of this masterpiece was. Variants of the modern iteration could be traced back to 2017, and some versions even had the black splash for Winding Constrictor. This decklist by Themata surfaced on Magic Online about a year ago, and it featured synergistic cards such as Winding Constrictor, Dromoka's Command, and also Lingering Souls out of the sideboard. Fast-forward to 2018, the archetype came under the spotlight when Matt Nass went 5-0 with this list. Originating from the Affinity shell, the innovative Throne of Geth – an ingenious and advantageous engine - took the place of Winding Constrictor while easing the mana base significantly. Sparring Construct and Damping Sphere were additions from Dominaria. Since then, there had been numerous advocates for the product we see today, including Matt Nass himself, Sam Pardee, Ross Merriam and so on. However, it was Johann Fink who piloted the deck to its biggest success yet. Fink was entangled in a six-way tiebreaker tussle but lost out by a hundredth of a percent, eventually placing a heartbreaking 9th. This was a testament to the deck's ability to shine on a bigger stage. Early in Day 1, word on the street was that numerous Hardened Scales Affinity decks had surged to the top of the tables. The deck was seen on camera. The deck was featured at the Featured Match tables. Watching it in action was truly sensational. However, by the time Day 2 rolled around, the deck seemed to have “crashed out”. Speaking to Juliano Gennari Souza, who made the Top 4 at Grand Prix Santiago earlier this year – but failed to make the Day 2 cut this weekend - he meticulously watched all of Matt Nass's videos, took down extensive notes, and fine-tuned the sideboard plan against all the major decks in Modern. He felt that the deck was consistent enough, although it relied heavily on its namesake card, but it was truly powerful and had a solid game plan against the rest of the field. Interestingly, Vinicius Karam made the Top 8 with a “regular” version of Affinity, the original version which did not play Hardened Scales. Which was better? Perhaps I'll ask Frank Karsten for a “totally unbiased” opinion. Do you know what makes up a friendship? Let me tell you a story between two Magic players. Jody Keith from New Orleans had been a Magic player for a long time and was known for his mastery in Legacy. In the past few years, he racked up numerous high profile finishes on the StarCityGames circuit, including a Legacy Open win in Atlanta last year. Meanwhile, on the other side of the equator, Bruno Vierira Ramalho was also known locally as one of the most experienced Legacy players in Brazil. Aside from their love for Magic and Legacy, what did these two players have in common? They were both huge fans of the Lands deck, a deck harnessing the power of Exploration, Life from the Loam, and the deadly combo of Thespian's Stage and Dark Depths. While most Constructed decks keep between twenty to twenty-five lands, the Legacy Lands deck can go up to thirty-five. Their unwavering love for this unique deck was the unique bond between these two men. 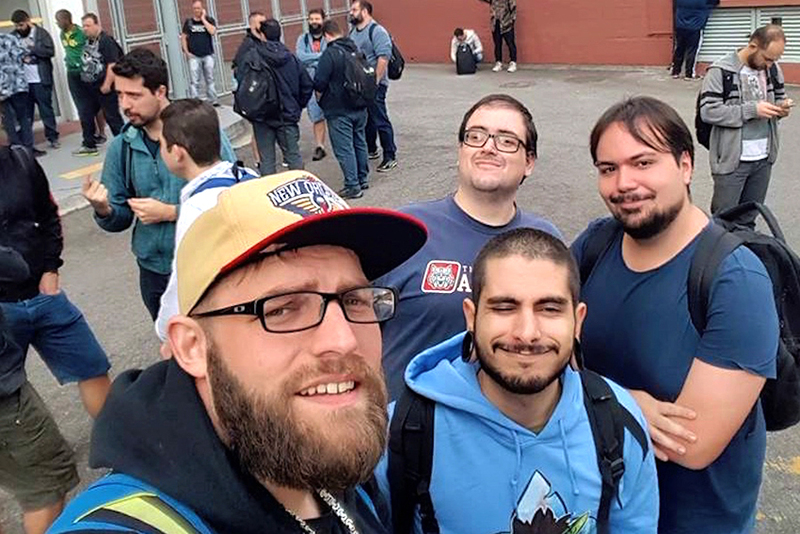 Ramalho dropped Keith a Facebook message after watching him dominate the StarCityGames circuit with Lands, and a budding friendship began to blossom. “When I saw him make the Top 8 at a StarCityGames Legacy Open in 2012, I knew he was probably the best Lands player at that time. I'm one of the very few Lands players in Brazil at that time, and I wanted to learn from the best, which was why I decided to send him a message. After a few conversations, it was clear that we were going to be friends for life. He didn't know it yet, but I did think he was going to earn a reputation eventually for being one of the best Lands players in the world." In Brazil, Ramalho shared that they had a lovely Legacy community, where everyone tries to help everyone. As one of the most vocal persons in the city, and also a Legacy writer for Ligamagic, he would regularly rope in his friends and their friends to play in his favorite format. “I didn't even own any cards when I started playing Legacy. However, many Legacy players didn't mind lending me their decks to attend tournaments. This culture lives on to this day, and we even have local judges bringing up to five decks to lend to players so that they could play. We also have an unofficial Legacy National Championship – organized wholly by players and judges – and we're now in our ninth year. Last year, there were nearly 200 players in attendance, and it's amazing what a long way we've come." São Paulo boasted the largest Legacy community in Brazil, while the number of Legacy players in the US also saw huge jumps over the last decade. Keith, who writes for StarCityGames, was glad to find someone as interested in Legacy as he was. Jody Keith and Bruno Vierira Ramalho, huge advocates of the Legacy Lands deck. “Bruno and I hit it off almost instantly. We began brainstorming new brews, finding new technology, and even think of ways to develop the community. From there, we started to get to know each other even more. Nowadays, we pretty talk about everything, our friends, our families, and our lives." It is said that one of the most beautiful qualities of true friendship is to understand and be understood. Both Ramalho and Keith consider each other among their best friends, as unlikely as that would seem considering that they live in entirely different parts of the world. Throughout the six years of being “virtual pen-pals," Ramalho had been asking when Keith was going visit. “Flights were usually quite expensive. However, I did want to go to Brazil eventually. I knew it was going to be the best vacation ever. The chance came when I made Top 16 at Grand Prix Seattle. With the $1000 prize money, I decided to buy an air ticket to come to Grand Prix São Paulo, not only to play Magic but finally meet Bruno." Ramalho started chuckling. “Are you gonna tell the story about your visa?" “Oh, that's an amazing story. So, I put in my application for a visa, and I also purchased my air ticket. Due to some hiccups, I was expecting the application to be delayed. I didn't have the heart to tell Bruno yet, but I did cancel my air ticket. I also canceled my leave and went back to work on Tuesday morning. Bruno was expecting me to hop on the overnight flight and arrive on Wednesday morning, but I did not even have my visa yet. In the nick of time, I received the notification that my application had gone through, so I called my airline to say that I wanted my flight back. That very same night, I was on the plane to South America for the first time in my life." Ramalho was overjoyed. He resided in Campinas, a 60-mile drive away from São Paulo. That didn't stop him from picking Keith up at the airport and then driving all the way back. Ramalho would host Keith in his own home for a week, and together they embarked upon the greatest adventure of their lifetime. “Bruno brought me to the city where he grew up in and brought me to taste the local food. I have fond memories of Cachorro Quente, which is the Brazilian version of a hot dog except it's filled with mashed potatoes. We have hot dogs and mashed potatoes in the States, of course, but this was simply delicious. We went sightseeing around Avenida Paulista, visited the São Paulo Museum of Art, and on Friday, we came to the tournament site to watch the live FIFA soccer match." Ramalho added, “I'm just overjoyed to be here with my friends, especially Jody. I did not make Day 2, but I will say that I don't mind it that much because my goal was to meet Jody and show him our community and my country. Regardless of whether I win or lose, I'm just happy to be playing Magic and being with my friends. Jody didn't make Day 2 either but he's currently playing the PTQ. This evening, I hope we will be able to show him the Liberdade Street Market, an art and handicraft fair which operates only on weekends. Also, tomorrow is a national holiday, and I've organized a huge BBQ cookout party. We're expecting around 30 people to come to enjoy traditional Brazilian churrascaria and play Magic together!" Magic is indeed a game without borders. As the adage goes, though miles may lie between us, we're never really far apart, for friendship doesn't count the miles, it's measured by the heart. This story between Jody and Bruno is but one of the millions of friendships forged through this game we all love. I know for a fact that my best friends – and likely lifelong friends – came out of our shared interest in Magic. Was this what Richard Garfield was going for when he designed this card game? Probably not. Much like all he envisioned, everything turned out better. Maybe this is the true meaning of the word 'gathering', which appears on the back of every single Magic card. Eduardo Terranova, 40, and Fabio Pinto, 50, have been friends for 25 years. In fact, they were among the first few players in Brazil to receive their DCI number! To call them a pioneer would be a gross understatement. At one point, they were possibly the only twenty Magic players in all of South America. Eduardo Terranova and Fabio Pinto, two of the first Magic players in Brazil. At one point, nobody had DCI numbers in Brazil. The only reason we got a DCI number was because Fabiano de Castro e Castro – winner of the first Brazil Nationals – had to attend the 1995 World Championship. Everyone who wanted a DCI number put in their name and that list was sent to Wizards. Everyone on that list was given a six-digit DCI number, beginning with the numbers 115. Because Fabiano was the National Champion, I believe he received 115000 or 115001. The rest of us received our DCI numbers in alphabetical order. Those were the first ever DCI numbers in Brazil. “When Magic first arrived here, it was sold at a few newsstands, the Devir store, and a couple of other places. There were so few boosters in circulation that we had to try so hard to get out hands on them. For example, if I wanted to get ten boosters, I would have to contact five places which sold Magic, place an order for ten boosters each, and only get maybe 1 or 2 boosters from each location!" It's hard to believe, I know. As a Magic player of over two decades, I myself find it incredulous yet fascinating. Terranova and Pinto continued to tell me their tale, as I continue deliberating whether they were presenting fact or fiction. That's only the story about the boosters. You must be wondering how we even built our decks. Most of the time, we did not have enough cards to make 60, and we basically had to play with whatever we had. Every deck looked like a Sealed Deck, and nobody wanted to let go of his or her cards unless he or she got something precious in return. I even witnessed a player trading a Bayou for two basic lands, because he was desperately trying to scrape together 60 cards to play. You don't get an unlimited supply of basic lands back in those days, so things were kind of crazy. Building on that, it took me four months to get a play set of Counterspell. I was trading like crazy, basically begging anyone who had any cards to let me take a look. There was no such thing as a market, and there were just so few cards in existence. Eventually, I put together a White-Blue control deck (oh my god, that deck was the nuts, back then). I started by playing a lot of counterspells and removal, and I thought about how to win. I did not want to play with creatures because I wanted to prevent my opponents from using their removal spells. Besides, it was challenging to find Serra Angel back then. Since we lived in an era with no internet, no card lists, and no information, it wasn't until six months later when I discovered the card Millstone. Oh, speaking of the metagame! It was hilarious now that we think back. Since the community was so small and Devir was the only store running tournaments, we pretty much knew everybody and even what cards they had! For example, we would say to each other, “hey, you're playing that Disintegrate guy” and “your opponent is the one with the Nova Pentacle." Every single card we owned, even the basic lands and the bad commons, were prized possessions. Our one-and-only deck was also extremely personal, and there was no such thing as “netdecking." By then, Magic had just stepped into Necro Winter, one of the most epic eras of our history. Terranova added Winter Orb and Icy Manipulator to his White-Blue control deck. With sufficient permission and removal, he was occasionally able to beat the sea of Necropotence decks. In such a well-connected and globalized world we are in, it's difficult to believe the hardship which our pioneer Magic players go through. Word of mouth communicated everything – either by meeting up in person or over the telephone – or from the message boards at local stores. The grapevine was your only source of legitimate information, and the rumor mill was the most reliable resource you had. There was no confirmation as to which cards existed in which expansion and many times players did not even know the rarity of each card. Players had to share contents of boosters and display cases with one another and work together as a team to figure which were the rares and which were the uncommons! So, there was one time, I got a phone call from a friend. I was sitting at home, and I was told that there were a few booster packs at a store nearby. I jumped out of my seat and ran to that store, hoping to get it. This happens all the time, Sometimes I get lucky, and I would be extremely, extremely happy if I managed to buy a few boosters. Other times, I walk out of the store disappointed. Wow. I can't even imagine. I only started playing in The Dark and Ice Age, as I shared with Terranova and Pinto, and that was just a few months after. Oh, few months made a huge, huge difference! Let me tell you a story. My first tournament was at Devir, and there were like 26 players. A year later, there was a major tournament at a local bookstore with 64 players. The community grew by around 40 people in a year. Yes, only 40! At that time, I owned a restaurant, and I decided to try running tournaments myself. We advertised, once again by word of mouth, and we were astonished to get 66 players! I was so happy I made hot dogs for everyone! We eventually got that tournament sanctioned but that process took three years! Anyway, I'm glad to see it in my Planeswalker Points log as my first ever sanctioned tournament. After 1996, we felt extremely sharp growth. To put things in perspective, Pinto's first Brazil National Championships in 1997 capped out at 256 players. By then, we were able to get 4th Edition Portuguese language boosters rather easily. I guess Wizards of the Coast realized that Magic was exploding. It was sold out all over North America. It was sold out all over Brazil, and I imagine it to be sold out everywhere around the world. They stepped up on production, and we managed to survive that drought. As the game proliferated beyond belief, as did Organized Play. The first Grand Prix in Brazil arrived in 1998 and was hosted at the National Historical Museum of Rio de Janerio. It attracted 638 competitors from all around the Americas. The legendary Jon Finkel took it all down, and his only loss all tournament was in Round 1 - because his cab driver brought him to the wrong museum! From just five Grand Prix in the 1996 – 97 season, we now have around fifty Grand Prix all around the globe. I guess the most significant difference between then and now was how much the game had grown. I lived during a time where 26 players were considered many, and over 600 was the most anyone had ever seen. Today, you can visit any Grand Prix and expect at least a thousand to a few thousand. Eduardo Terranova and Fabio Pinto did not play in the main event. Instead, they dropped by to meet old friends and soak in the magical atmosphere. 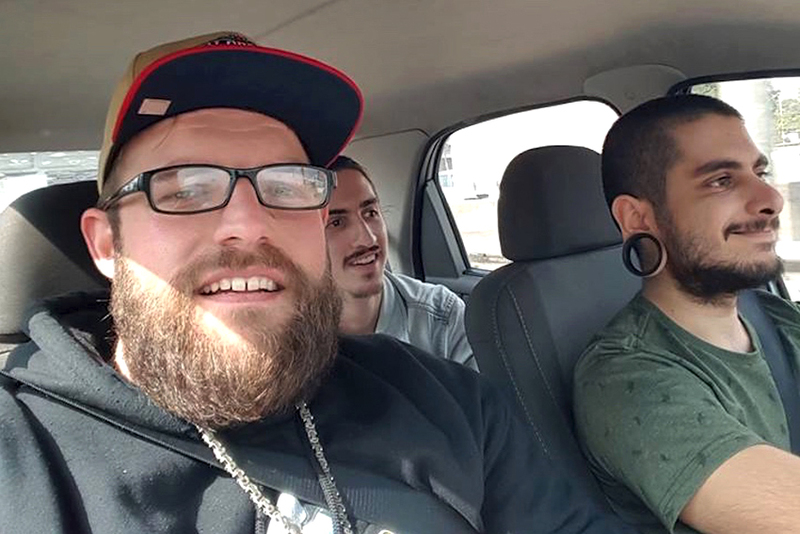 Just like Magic: The Gathering, these two veterans have come a long way. I'm delighted I was introduced to these two fine gentlemen. I relished every moment as they poured out their stories and as I was writing this story, I felt intermittent goosebumps arising from the sheer nostalgia. Think about it. It would be disastrous if our paths never crossed. These untold tales would quietly fade into oblivion rather than becoming a cherished chapter of our illustrious history. Anet Carolina was a film producer by trade. Aside from creating a few short films and a web series, she was currently working on her first full-length feature. As a driven professional with a strong desire to excel, it was not difficult to imagine her transformation from a totally new Magic player into a seasoned grinder within two months! Nearly three years into the scene, she quickly became a household name all around Brazil. Carolina's first event was a Friday Night Magic tournament, followed by the Magic Origins Prerelease. A month later, she was participating in Pro Tour Preliminary Qualifiers (PPTQs) almost every week. “My ex-boyfriend used to play a long time ago and he decided to return to the game. While we were dating, he taught me how to play and I went straight into the competitive scene in under two months. Even though we are not seeing each other anymore, we are still best of friends and we continue to play Magic together to this day!" She won her first PPTQ using a White-Black Control deck but professed that she favored aggro decks more. “Don't get me wrong, I really liked that White-Black Control deck because it was proactive and it was also really powerful. However, I switched quickly to aggro decks because I felt it suited my play style more. I'm not the type who enjoys sitting around hiding behind my Islands, for example. I like my games with a little more excitement!" Despite being a relatively new tournament goer, Carolina quickly garnered a lot of attention, mostly due to the great results she amassed so speedily. She only played in four Grand Prix so far (including this one) and she already made Day 2 at two of them. Bringing her Naya Burn deck to the tables this weekend, Carolina started out strong in Day 1, finishing the day at 7-1, but ended up 9-6. Nonetheless, this was her best record so far and she hoped to do better in the upcoming months. She also participated in two Regional Pro Tour Qualifiers (RPTQs) for a shot at attending the Pro Tour. Overall, that's a really solid showing for a player with less than three years experience. “There's a nonprofit, Played Forward, and they were awarding a free playmat and free entry to any Grand Prix to the girl who finished highest in the main event. There are a lot of girls playing this weekend but sadly I was the only one who made it to Day 2. I intend to use the reward at Grand Prix Mexico City or Grand Prix Orlando. I haven't quite decided yet, but I'm roping in a few of my best friends to go with me!" Three months ago, Ligamagic approached her and she began contributing content on a regular basis. Her articles generate an average of a few thousand views, with her most popular pieces breaking fifteen thousand hits. Quickly rising from a novice into an influencer, she shared with us some of her thoughts about the future of Magic. “I'm interested to see what Magic: The Gathering Arena will do for the community and I feel that there is a lot of potential. I'm also hoping that more girls will start playing Magic, and Arena might be a way to reach more female audiences. It is a great game and I think everyone should try it. I'd like to thank everyone for their support, including my team, my friends and family, as well as all my readers. Thanks for taking me in and making me feel like part of the family." With that, we bade goodbye to Carolina as she headed over to watch the Unlimited Edition booster draft. By the time we got to the giant screens, we witnessed Time Vault being cracked open. “Oops, I don't know all the cards yet, since I'm still quite new But, don't worry, it won't take long for me to learn everything about our world!" As Anet Carolina and I parted ways, the crowd was roaring. In Gabriel Fehr's first booster pack, he cracked Time Vault, the first of two of the evening. The enthusiastic crowd gathered around the giant screen, hoping to see a Black Lotus emerge from twenty-four Unlimited Edition boosters. However, we were mildly disappointed to not see any Power 9, but there were still tons of goodies up for grabs. Going into the tournament, the crowd favorites were 4th-ranked Luis Salvatto and 5th-ranked Márcio Carvalho. In Cavalho's case, he was going for his second Unlimited Edition draft victory in eight days and he put together a rather formidable Esper Control deck featuring Icy Manipulator, Drain Life, Guardian Angel, Jade Idol, and the mighty Mahamoti Djinn. In a cruel twist of fate, it was the flying fattie which eliminated Salvatto, when they played each other in the semifinals. Márcio Carvalho's Esper Control deck was truly amazing! In the finals was Gabriel Fehr, who made Top 8 at the the 2014 World Magic Cup as a member of Team Brazil, as well as the Top 8 at Grand Prix Porto Alegre 2015. Despite playing a deck with twenty-six lands – and two more additional mana sources in the form of Dark Ritual and Basalt Monolith – he was able to secure a victory against Carvalho. Congratulations to Gabriel Fehr for winning Grand Prix São Paulo's Unlimited Edition draft! “Kormus Bell was the most important card of my deck and I had two. Since I was also playing so many lands, it made my two Frozen Shades and Disintegrates more dangerous. I had a lot of fun and I enjoyed every moment of the Unlimited Edition draft." São Paulo in High Spirits! Even among a slew of archetypes like Amulet Titan, Ironworks, Affinity, and Tron, the two players who met in the finals both ran very fair, very interactive decks. 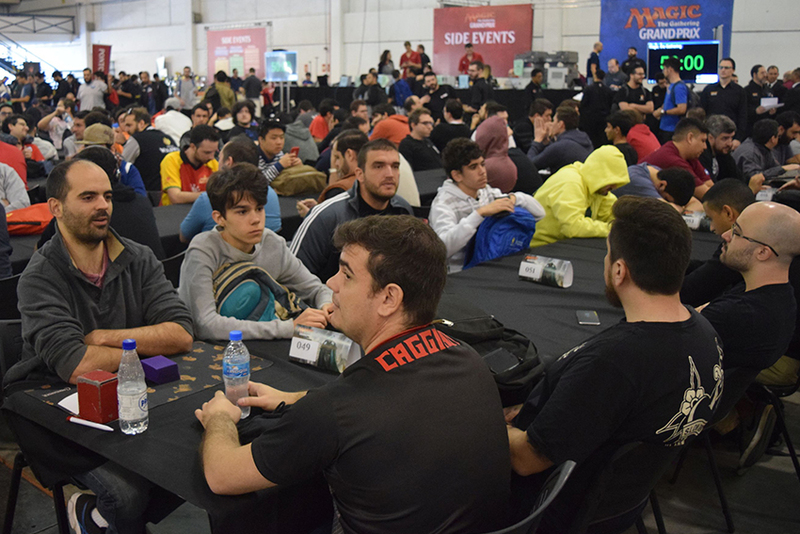 A veritable purgatory of Spirits flooded the feature match area, as Jose Echeverria and his Mardu Pyromancer faced off against Leonardo Giucci's Abzan Traverse. Lingering Souls didn't linger long but went to work on both sides. It proved the most important card of the match, although Echeverria's Faithless Looting and Bedlam Reveler did of course help to keep the Spirits flowing. Mardu Pyromancer had been the number one deck in the metagame overall, taking up almost nine percent of the Day 1 field. In the hands of Jose Echeverria, it claimed the number one spot in the tournament too. 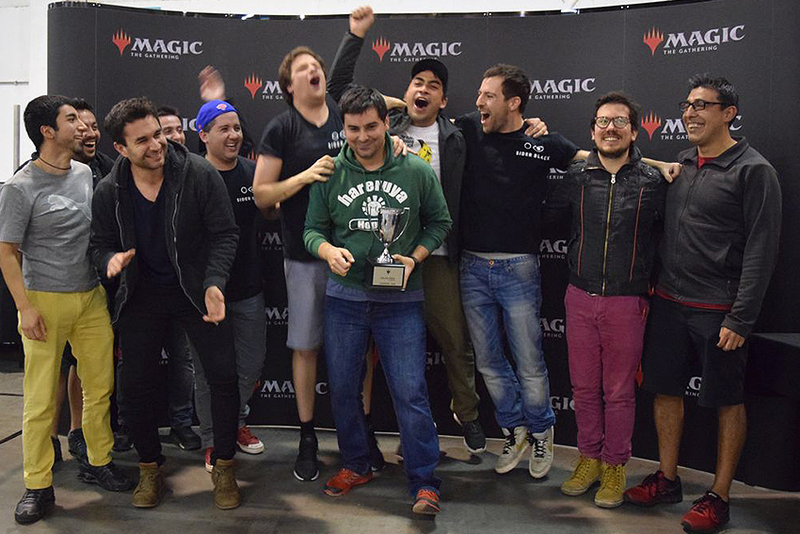 Brazil's community was in high spirits, and we'll join in saying: Congratulations to Jose Echeverria, champion of Grand Prix São Paulo 2018!